The Electronics Funds Transfer module (EFT) converts your payroll data into the format required by your bank. All formats are supported by this module including those required by chartered banks, credit unions and near banks. When you are ready to transfer the electronic funds file, simply use the software supplied by your bank. 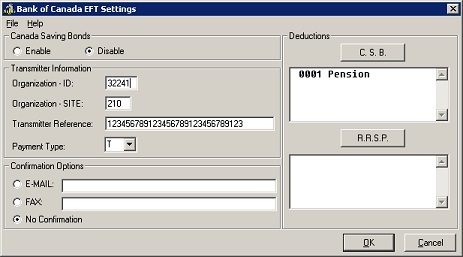 This module works in tandem with GrandMaster Suite's Payroll module. 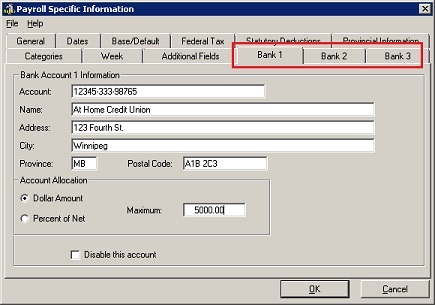 Using the multiple employee accounts feature you can apportion an employee's pay and electronically distribute it to multiple bank accounts (e.g. their savings, mortgage account and chequing accounts). The EFT module will assemble all pertinent payroll information into one file and electronically transfer it to your organization's bank for the multiple distributions. With bank transfers being made between 3 and 15 days prior to settlement date (i.e. payday), you can easily accommodate multiple pay runs at one time. This means you can pay a one-time bank transfer fee for multiple pay runs instead of multiple bank transfer fees. The EFT module has the ability to transfer based on batch sequencing. This is useful if your company offers payroll bureau services or if you need to segregate your transmissions for complex processing needs. Authorized deductions for Canada Savings Bonds, RRSP, home insurance and life insurance can be accommodated accurately and easily. Transfers can be even set up to be performed automatically. 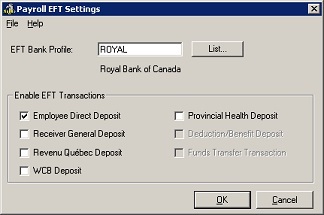 The EFT module provides pre-defined Employee Share Option Plan (ESOP) and Canada Saving Bonds (CSB) profiles for transfers that draw from funds from the employees' Net Pay. ESOP and CSB profiles can be tailored to your company's specific needs.